Never forget. Vietnam veteran honors brother, and fellow vet, by continuing to drive the 1969 Dodge Super Bee his brother left behind. 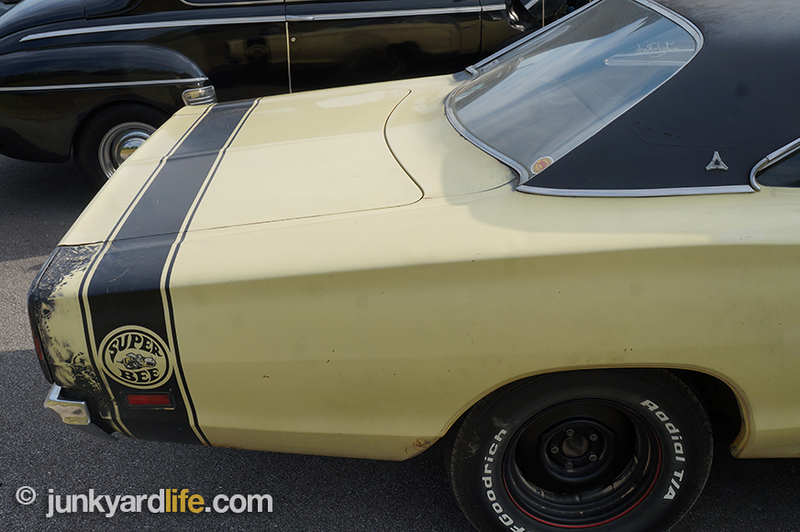 Tom Waters bought the yellow Super Bee in March of 1969 after serving a tour in the U.S. Marine Corps. The 22-year-old returned home to Statesboro, Georgia just long enough to fall in love with the Y2 paint, 383-equipped Mopar on the dealership lot. Tom’s payments were $111 per month. 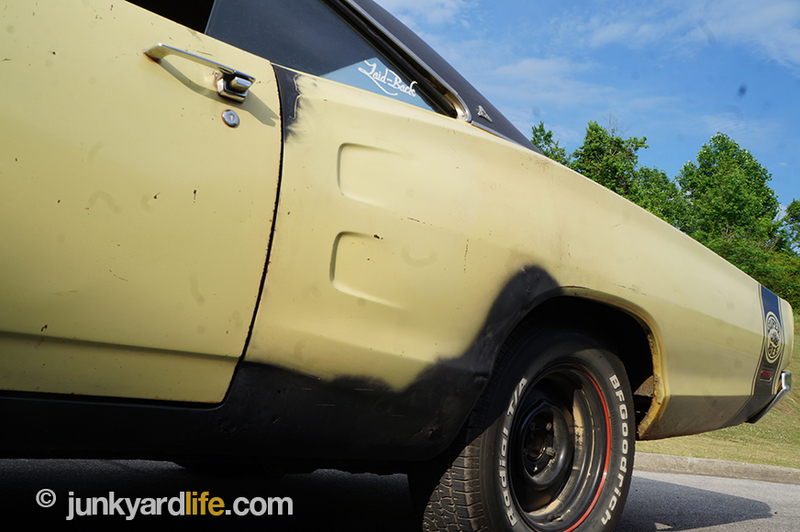 A few months after buying the Super Bee, Tom drove his younger brother, Danny Waters, to Estill, South Carolina. Danny was on his way to Vietnam courtesy of the U.S. Army. 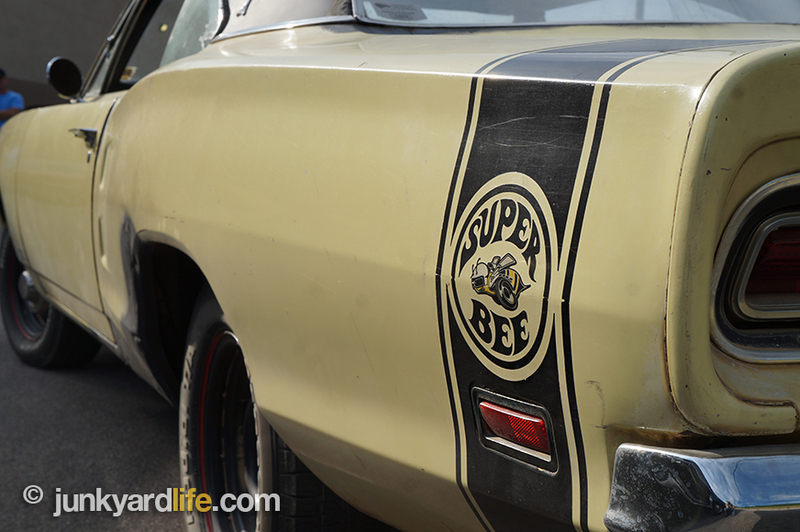 The memories from that trip in Tom’s Super Bee would last a lifetime. 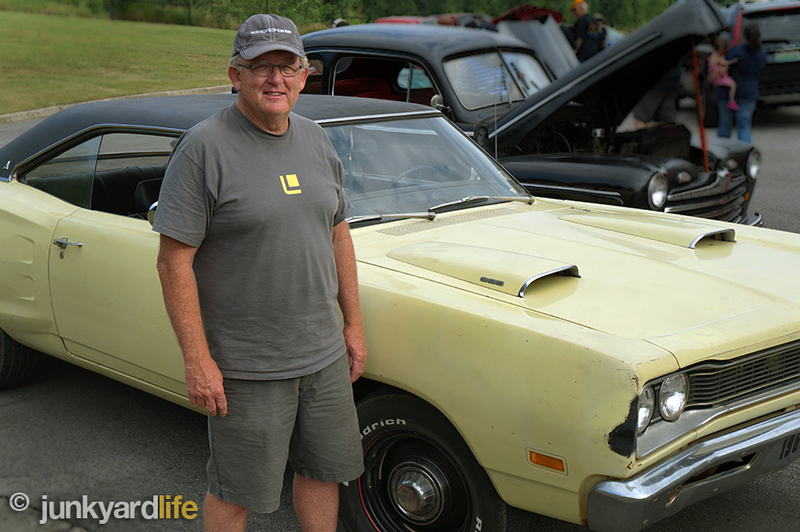 Vietnam vet Danny Waters drives the 1969 Dodge Super Bee his brother bought in March of 1969. The trip to South Carolina in the Super Bee would be the last time the Waters brothers would see each other. 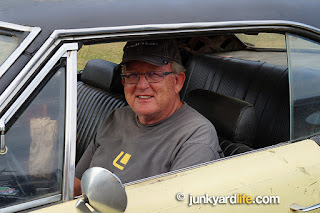 Before Tom made his fifth payment on the ’69 Dodge he succumbed to leukemia. Danny received emergency leave from the Army to attend his brother’s funeral. The family attributes Tom’s sudden illness, and untimely death, to time spent at Camp Lejeune (evidence of contaminated water supply). 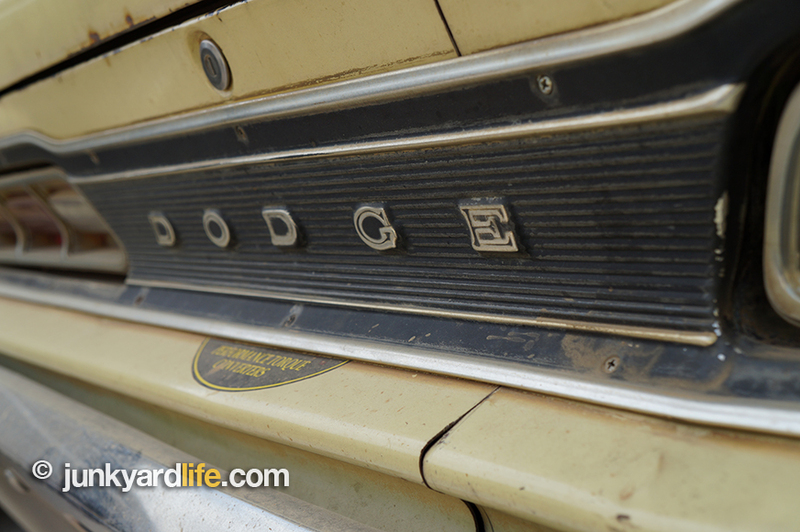 Dodge built less than 28,000 hardtop and coupe Super Bees in 1969. When Danny returned from active duty in Vietnam, his parents decided to continue driving Tom’s Super Bee. The car was new dependable transportation. Despite manual steering, and manual drum brakes, Danny’s mother became the primary driver of the Super Bee. 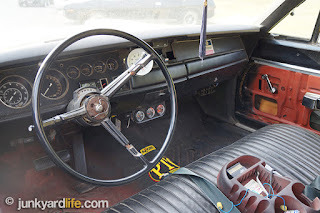 Other family members also took turns behind the wheel, as the Mopar served duty for college commuting and daily errands. Tom and Danny Waters’ Vietnam-era dog tags displayed on the dash of the 1969 Dodge. The Dodge did suffer a few dents and dings. Someone rammed into the quarter panel and the right rear corner also took a hit. 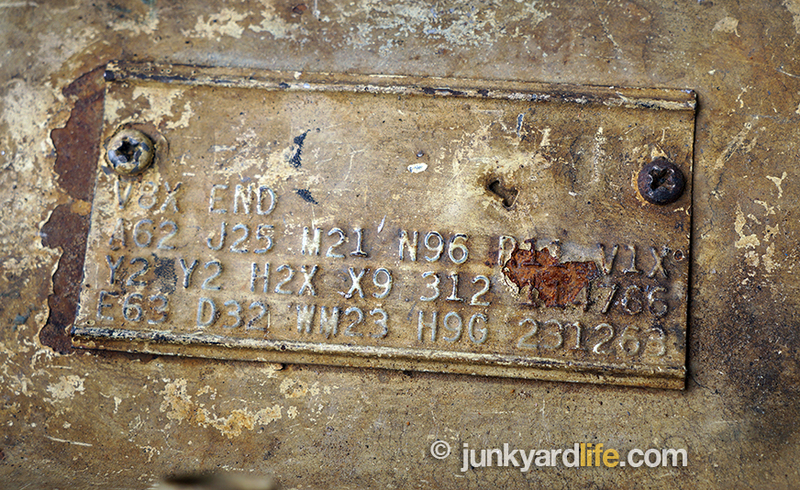 Traces of a patch panel can be seen on the side behind the driver’s door. 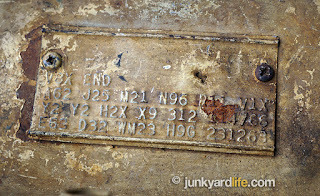 Most of the original Y2 paint remains. Some of the damaged areas have been covered with black primer. 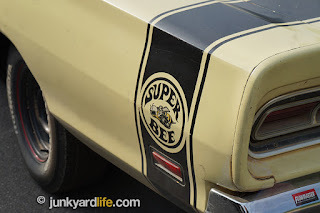 The damaged rear bumper was straightened and the Super Bee remained a one-family-owned driver. 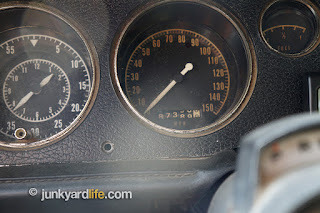 By the early 1990s, Danny’s mom grew weary of the difficult steering, and manual everything. 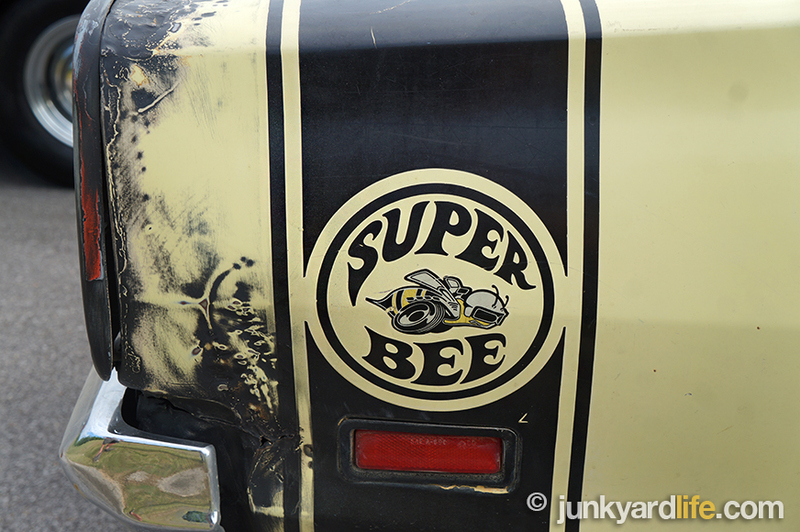 The Super Bee had been sent to the shed. 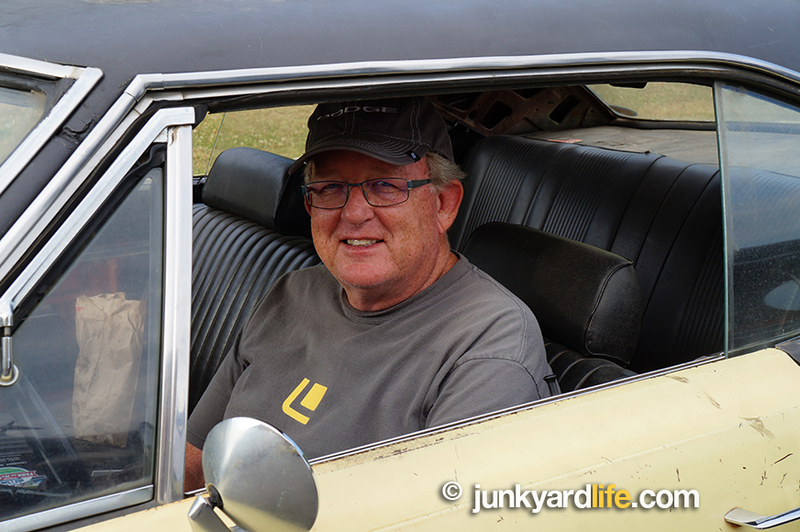 “My mother handed me the keys when the Dodge had less than 80k miles,” said Danny. The odometer now shows just over 87k miles. 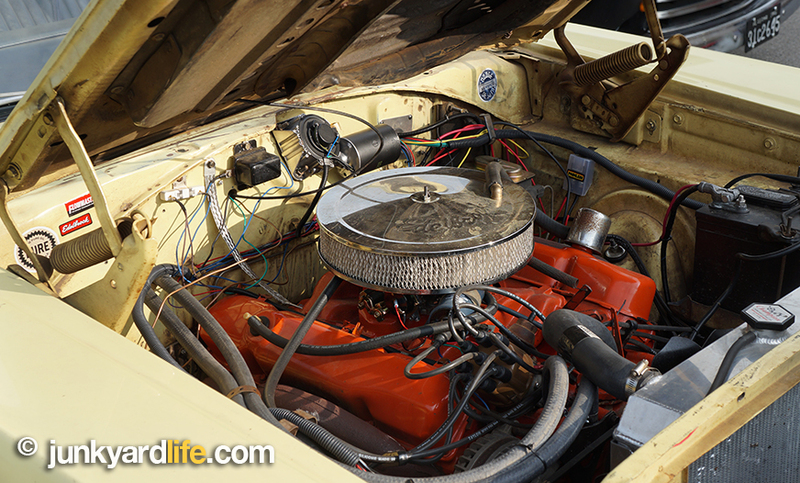 The 1969 Super Bee remains mostly original with 87,000 miles. 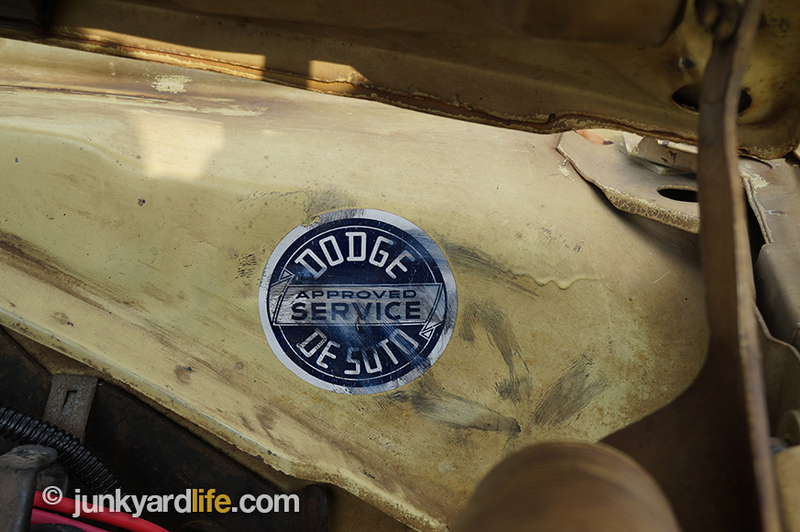 Dog tags for Tom and Danny can be found on the dash of the Dodge. Waters’ military uniform name patch is also on the dash. 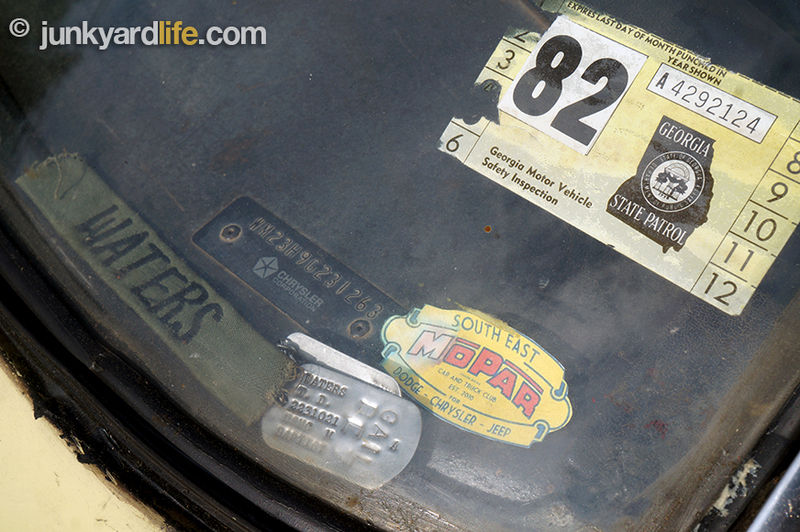 Vintage Mopar and Vietnam-era stickers can be found inside and outside of the Super Bee. 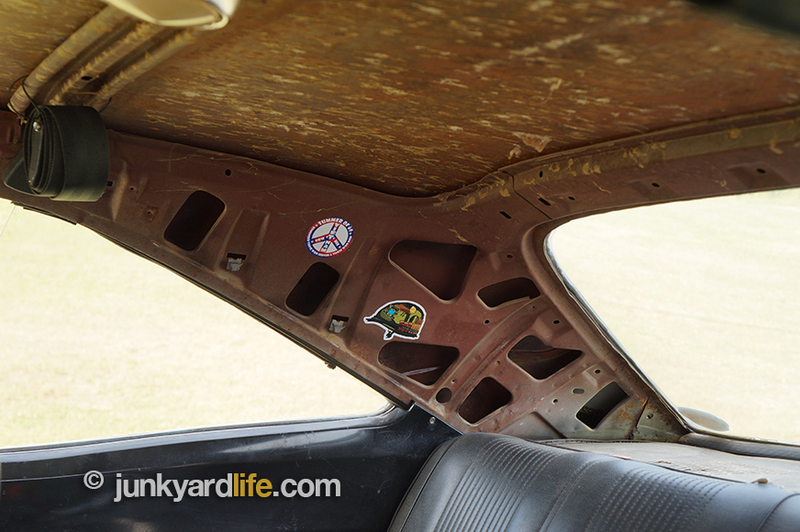 A few missing interior items, such as the headliner, carpet, and door panels give the car a true hot rod appeal. Every dent, scratch, and decal has a story. 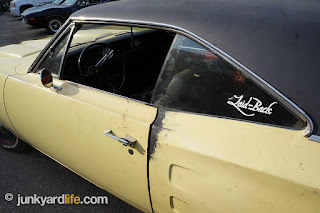 The quarter panel was patched after the Super Bee was t-boned. Danny shows the car at the occasional cruise-in, which is where I caught up with him in Fultondale, Alabama. 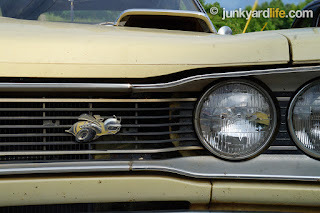 I noticed the Dodge pull in among the nearly 200 classics, and muscle cars. 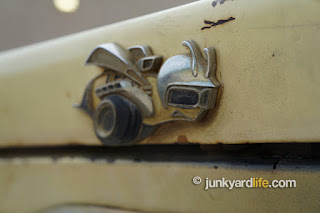 The cammed-up rumble of the exhaust and "Joe Dirt” vibe got my junkyard radar buzzing. Danny Waters and the 1969 Dodge Super Bee provided a Memorial Day tribute to Danny’s brother Tom Waters. If you paint it, you’re covering up all those stories. Nobody else has that. 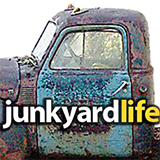 Anybody can buy a new car. Your family and those stories are what make the car special. Otherwise, its new paint, just like a new car. No heart. No character. Finding out the story on this 1969 Super Bee on Memorial Day weekend was a treat for me. Thanks for sharing Danny. Thank you for your service! The original 383-V8 engine recently received an upgraded cooling system. Rumble Bee stripe on tail of ’69 Super Bee. 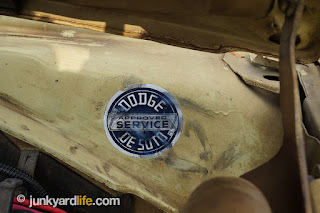 Several period correct decals can be found on the Super Bee. 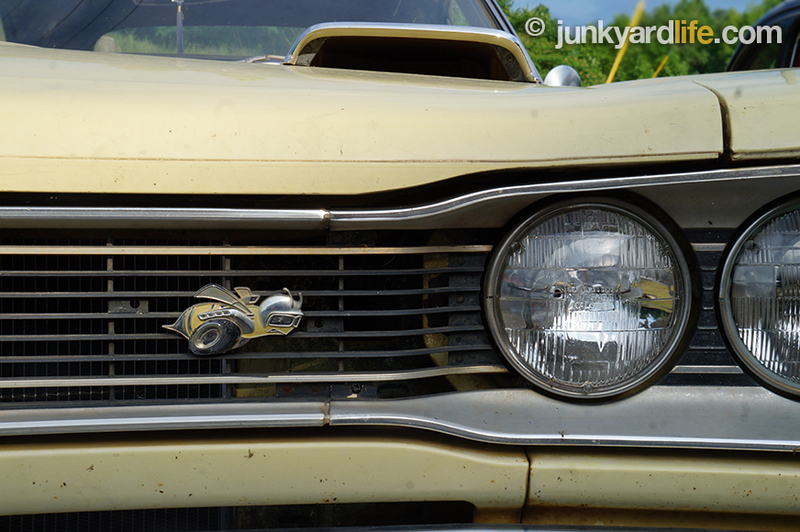 The Super Bee was Dodge’s “B” body, mid-sized, 2-door. Danny Waters added bigger fuel lines and a fuel cell in the trunk of the Bee. Twin forward-facing scoops were part of the “Ramcharger” air-induction hood. Vietnam-era stickers adorn interior roof. Missing headliner provide a race car look. Bench seat, with no power options – this was a standard, low-buck muscle car. Weathered paint, dull mirrors, big V8. This Super Bee looks dangerous in a good way. Swoopy rear glass is a sight to behold. 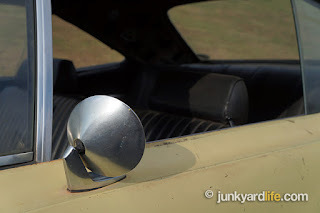 I’ve grown to love the subtle curves and design cues that litter the 1968-1970 Mopar intermediates. Bumper was straightened after rear end collision. Scars to the body remain under black primer. 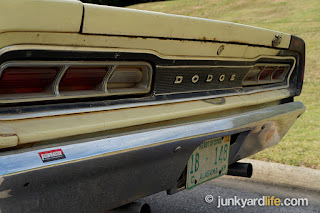 Dodge Super Bees had a 1-inch longer wheelbase (117-inch) than Plymouth Roadrunners. Coke bottle styling rocked the automotive landscape in 1968. In 1969, things got wilder with more scoops and stripes. 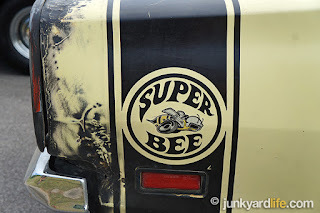 The Super Bee emblem decal package was well received but sales of the Plymouth Roadrunner dwarfed the Bees 3-to-1 in 1969. 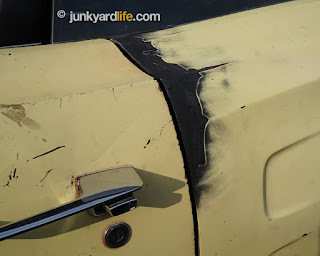 Worn paint identifies the high contact areas of the hardtop Bee. 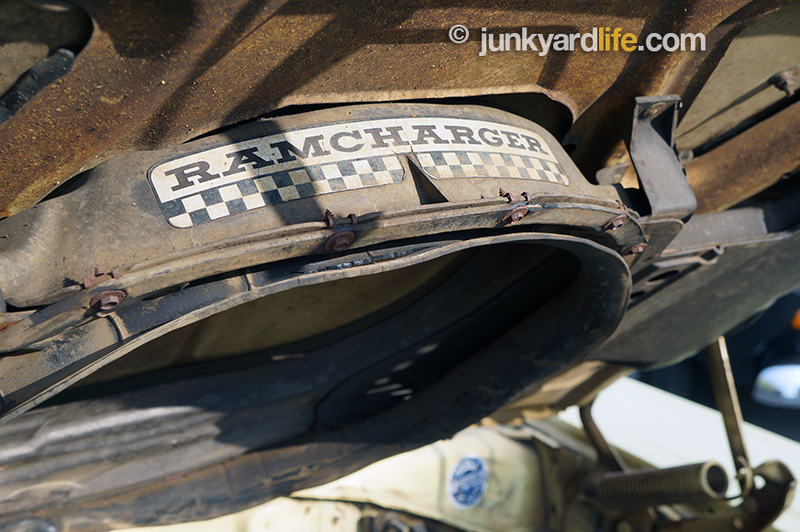 Ramcharger air-induction hood was a new option on the ’69 Super Bee. 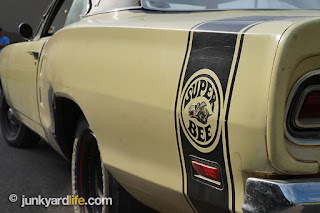 The animated Super Bee emblems are chrome-plated diecast medallions. Dodge’s 383-V8 engine delivered 335-hp at 5,200 RPM when new. 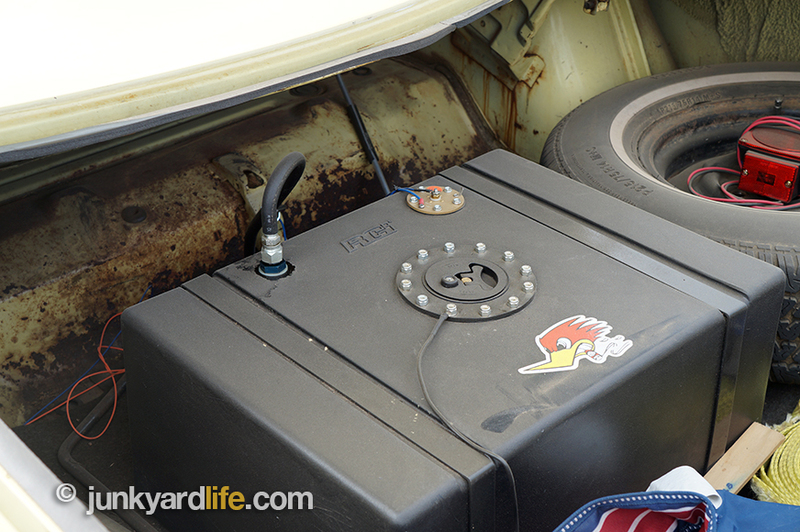 Trim tag identifies all the Mopar goodies on this ’69 Super Bee. 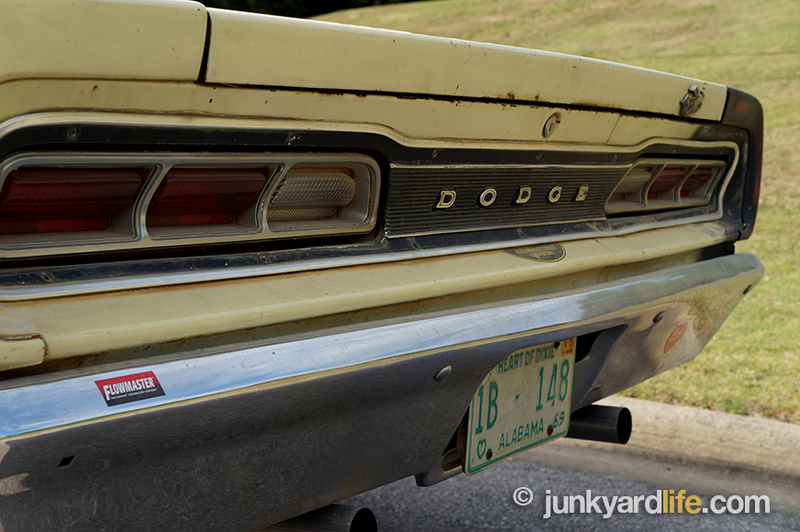 Styling elements from the Dodge Charger melded with the Coronet-based Super Bees of ’68-70 vintage. Steelies and dog dish hub caps up front, straight steel wheels out back. 48 years worth of memories. I’d say this Super Bee has been worth every penny.